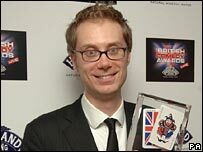 Stephen Merchant beat Extras co-star Ricky Gervais to take the best actor prize at the British Comedy Awards. But their show missed out in the best TV comedy award, losing to Peep Show starring double act David Mitchell and Robert Webb. Catherine Tate claimed the best actress award for her Christmas special. But the biggest winner was Harry Hill who took the comedy personality award, while his TV Burp show won best comedy entertainment programme. Merchant, who also has a show on BBC 6 Music, said he would like his Extras character, a bumbling actors' agent, to have a spin-off series. "I think he should have his own series where Barry and he set up a detective agency," he said, referring to his sidekick, the struggling ex-EastEnders actor played by Shaun Williamson. Gervais sent a message via videolink from New York. "A British comedy award, quite a prize. Not to me, I've won American ones," he joked. "But to people in that room this is probably the highlight of their career. "Enjoy the night. I'm off to have dinner with Jerry Seinfeld and Ben Stiller." Russell Brand and Charlotte Church were awarded best male and female newcomers, while student favourite Little Britain won the FHM and Zoo magazine vote for top stage show. Church said she was "over the moon" to win the prize for Friday night's The Charlotte Church Show. Who Wants to be a Millionaire? and ex-Tiswas host Chris Tarrant was honoured with an outstanding contribution to entertainment award. Chris Tarrant, who recently split up from wife Ingrid, dedicated his award to his children. "This is for my kids - I love you all very, very much. I will always be your daddy," he said. Other winners included Star Stories, which was named best TV comedy, and Jimmy Carr for best live stand-up tour. Sacha Baron Cohen, producer Dan Mazer and writers Anthony Hines and Peter Baynham, picked up the Ronnie Barker award for the creation of spoof Kazakh reporter Borat. Madonna presented the prize to Cohen, who made a rare appearance as himself: "Borat would be here tonight but he's guest of honour at the Holocaust Denial Conference in Tehran." But there was a sour note at the ceremony when Hollywood film-maker Oliver Stone shocked the audience with a bad-taste reference to the Suffolk serial killer. The director, who was there to present the best comedy film prize to Wallace and Gromit creator Nick Park, said: "It's great to be back in England. I feel like the Jack The Ripper days are back. Nothing ever changes here." Chat show host Jonathan Ross hosted the award ceremony, which was broadcast live on ITV.